Closed bought deal financing with a syndicate of underwriters for $22.5 million in net proceeds. A replay of the teleconference call will be available on March 13, 2012 from 10:00 AM Pacific Standard Time, 1:00 PM Eastern Standard Time until March 29, 2012 by dialing the numbers above. In addition, the call will be archived on the Company’s website. Great Panther Silver (NYSE-Amex: GPL; TSX: GPR) reported 4th quarter production of 545,294 silver equivalent ounces, an increase of 13% over the 3rd quarter. For the year ended December 31, 2011, metal production totaled 2,200,013 silver equivalent ounces, in line with October’s revised production guidance. Ore grades improved at Guanajuato, to 235g/t Ag and 2.12g/t Au, in November and December, the highest since September, 2010. Record metallurgical recoveries at Guanajuato of 88.5% for Ag and 90.7% for Au (up 1% and 2%, respectively). 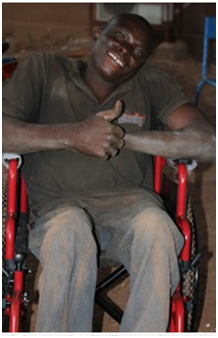 BabyBulls (ACCRA, Ghana) – Three companies, including our own African Gold Group (OTC Other: AGGFF; TSX-V: AGG), participated in a wheelchair donation program in West Africa this month. The wheelchairs go to needy residents of areas where metals prospectors and miners work. In this case, the good news came to 260 chairs in Mali and 260 in Ghana. A longtime friend, Gordon Holmes of The Gold Report, spearheaded the wheelchair idea a few years ago via a winery he owns up the freeway from where I live in northern California. “Each shipping container holds 260 chairs,” Gordon told me today (Thursday). I got to experience the wheelchair spirit in November, when Great Panther Silver, another of our Torrey Hills clients, and Endeavour Silver chipped in to donate a bunch of them near Guanajuato in Mexico. The emotion was intense. BabyBulls (SAN DIEGO) – BabyBulls recently spoke with Bob Archer, President and CEO of Great Panther Silver (NYSE-Amex: GPL; TSX: GPR). In this interview, Bob discusses the Company’s two wholly owned mines in Mexico and detailed expectations for the Company as we begin 2012. Great Panther Silver (NYSE-Amex: GPL; TSX: GPR) has finalized arrangements to sell all available concentrate inventories from Guanajuato before year end and is well advanced in securing new contracts for fiscal 2012 concentrate sales for both the Guanajuato and Topia Mines. This will ensure strong fourth quarter revenues which will balance out the previous revenue shortfall in the second quarter. Looking forward to next year, the Company expects metal production growth of approximately 20% year on year from its two wholly owned Mexican silver operations. The Company estimates metal production in the range of 2.50 to 2.75 million silver equivalent ounces for fiscal 2012. Great Panther Silver Ltd. (TSX: GPR; AMEX: GPL) provided an update today on a further 12 surface diamond drill holes from their ongoing program at the Company’s wholly-owned San Ignacio Project in Guanajuato, Mexico. Drill-holes ESI11-039 to ESI11-050, inclusive, were drilled from section 450N to section 700N, confirming vein continuity with mineralized vein widths of up to nine metres, and in-filling the Intermediate zone extension to the south, and defining the Nombre de Dios zone. Assays from drill core continue to demonstrate higher gold:silver ratios than at the main Guanajuato Mine. Highlights of the Intermediate zone drilling include 213g/t silver and 5.12g/t gold over a true width of 3.26 metres, and 201g/t silver and 6.34g/t gold over a true width of 4.96 metres in ESI11-039 (section 450N). Presently, and through to February 2012, the drill rig is completing fill-in holes to upgrade the mineral resource estimate, anticipated near the end of the second quarter of 2012. A second drill will be added to the project in the first quarter 2012 to expand the drilling south of section 450N for approximately 800 metres, northwards of section 900N for approximately 300 metres, and to initially test a 600 metre strike portion on the southern San Antonio claim. You are currently browsing the archives for the Great Panther category.